Laparoscopic gastric bypass surgery involves stapling the stomach and re-routing the small intestine to form a small stomach pouch about the size of an egg. Your cardiovascular, pulmonary and endocrine systems must be evaluated before undergoing gastric bypass surgery. A psychological evaluation is also an important part of your preparation, to determine your response to dramatic weight loss and your new body image. You will also be counseled about dietary and nutritional issues related to your surgery. 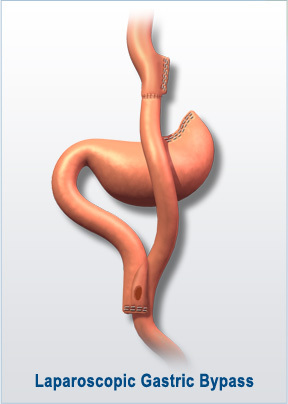 During gastric bypass surgery, a limb of intestine is attached to the pouch to create a bypass. After surgery, food enters the pouch and empties into the small intestine. As a result, food bypasses almost all of the stomach and a segment of the intestine. The overwhelming majority of surgeries are performed laparoscopically using small incisions, 1/4-inch to one inch in size. Your surgeon will determine the best approach for you based on your medical history, height and weight. After surgery, you will feel satisfied with eating smaller portions because your stomach will only hold a small amount of food. Thoroughly chew your food so it does not cause pain when traveling down your intestine. Remember to take the appropriate vitamins and supplements. Also, schedule follow-up visits with your doctor to check your physical and mental status. The major benefit of laparoscopic bypass surgery is dramatic weight loss during the first year following surgery. With this weight loss comes the reduced risk of medical problems like diabetes, hypertension and coronary artery disease. You will also see less scarring after this surgery because the incisions are smaller than those of traditional abdominal surgery. If you would like a representative from our office to contact you, please fill out the below information.